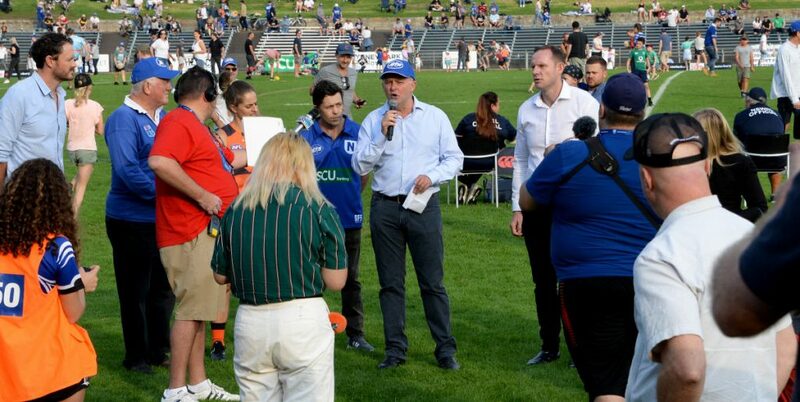 Report on the 22nd round ISP NSW match between Newtown and Newcastle, played at Hunter Stadium on Saturday, 6th August 2016 by Glen ‘Bumper’ Dwyer. 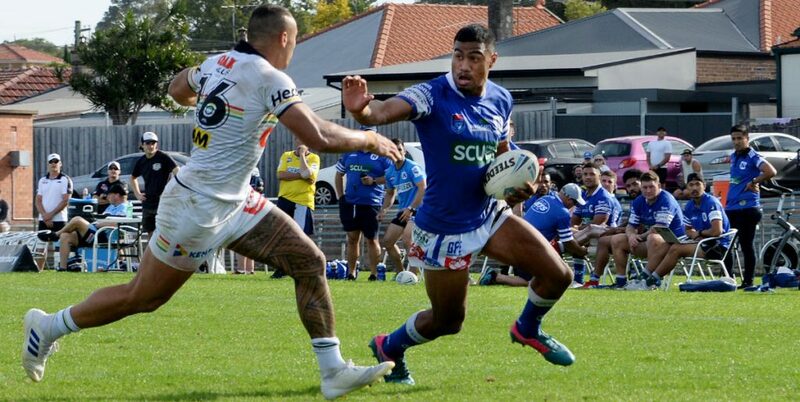 It was another close call for the Newtown Jets when they defeated the Newcastle Knights 22-19, through an unconverted try in the 77th minute of this 22nd round match. The Jets had travelled up to Hunter Stadium with a considerably changed team from the line-up they had fielded against Penrith on the previous weekend. 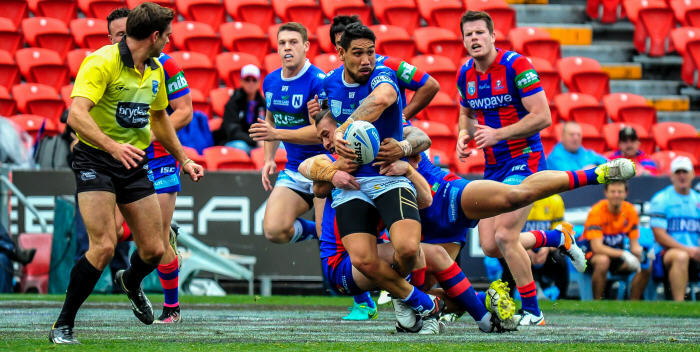 This match was played in wet conditions and while the Knights might have been at the bottom of the Intrust Super Premiership NSW points table, they came into this home game primed for an upset. 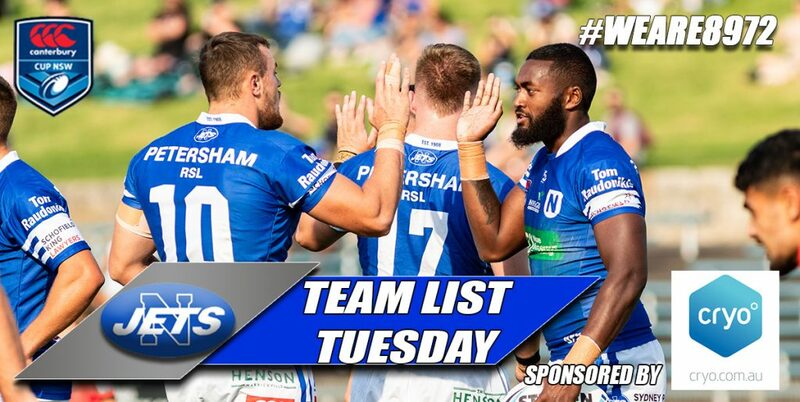 The Newcastle team was also strengthened by the return of several players with NRL experience, plus for both sides there was the added incentive of appearing live on Fox Sports TV. The Knights were first to score when they took full advantage of the Jets’ inability to defuse a well-judged grubber kick into their in-goal. Newtown’s two ex-Ipswich Jets players, centre Kurt Capewell and five-eighth Josh Cleeland, showed they were ready to contribute when their great kick/chase effort gave the Jets good field position. Shortly afterwards Capewell stepped and weaved his way past two Knights defenders to score next to the southern goal-posts. He converted his own try and it was 6-all. 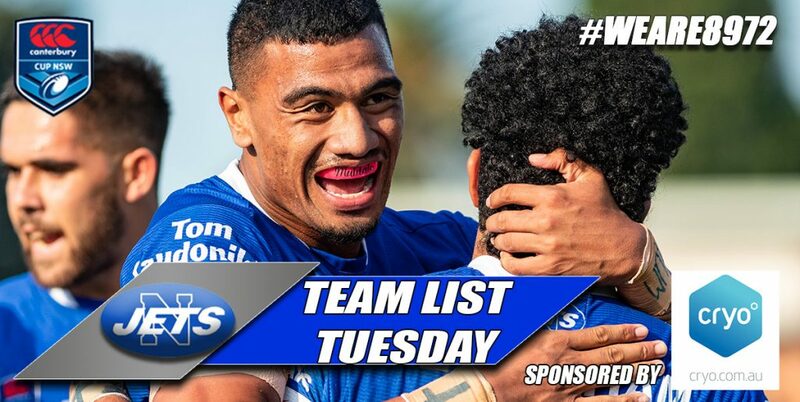 Hawkes Bay product and second-rower Kenny Niko hit and spun his way to a determined try in the 26th minute, and Capewell again converted for Newtown to lead 12-6. Cleeland went close to scoring two minutes later, but the Knights hit back with a try wide out in the 31st minute. The conversion tied the teams up at 12-all. Close to halftime the Jets fumbled a high kick near their own tryline, and from the scrum the Knights kicked a field goal to take a 13-12 lead into the break. 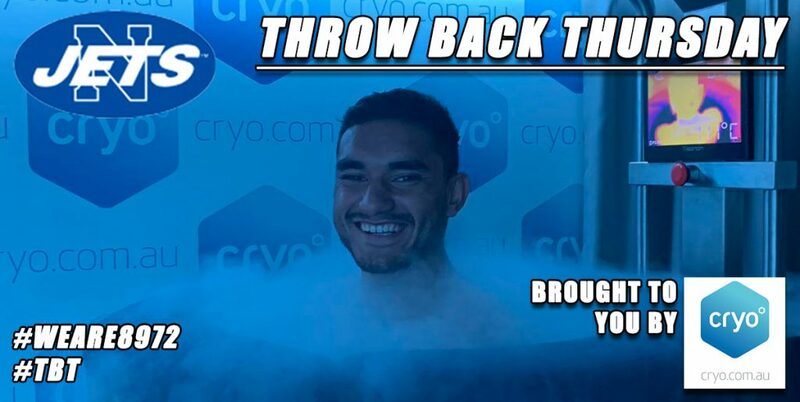 Kurt Capewell was again involved when he combined with fullback Jaline Graham in the 46th minute for Graham to score under the posts. Capewell added the extras and Newtown had regained the lead at 18-13. The Knights made use of a penalty to get down to Newtown’s end, and through some effective second-phase play put on another try down their left-side. A splendid conversion from the sideline and into the wind and rain gave Newcastle a 19-18 lead. Newtown’s game had started to come apart with repeated handling errors and penalties. The Knights had gained the ascendancy midway through the second half and went close to scoring on a couple of occasions. The Jets made five errors in less than ten minutes and put their defensive structure under great stress. The clock was starting to work against the Jets but they received a lucky break when the Knights were penalised for back-chatting inside Newtown’s quarter. The Jets worked their way downfield even though the ball changed hands twice through knock-ons. With time was running out, the Jets moved the ball to the right on the fifth tackle and then quickly switched play back to the left. Graham, Cleeland and Arana Taumata were all involved as they put left centre Lachlan Stein into a gap and over to score. Capewell’s conversion attempt from out wide bounced off an upright but the Jets were back in front 22-19 with two minutes left. The Knights regained the ball from the kick-off under dubious circumstances but the Jets held on desperately to win a real thriller. Jets coach Greg Matterson pointed to the poor handling, defensive lapses, concession of penalties and a fifty per cent second-half completion rate as the main reasons for Newtown’s close shave. Kurt Capewell was clearly the man of the match while forwards Jesse Sene-Lefao and Malakai Houma had worked really hard. 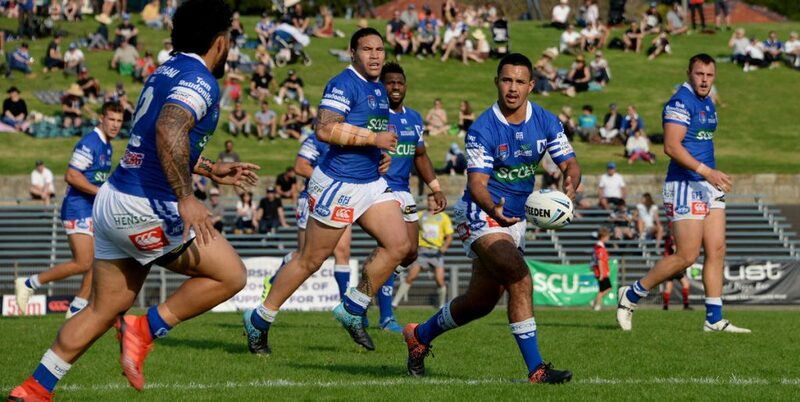 The Newtown Jets take on the front-running Mounties (the Canberra Raiders partnership club) at the Aubrey Keech Reserve, Hinchinbrook on Saturday, 13th August, with this 23rd round ISP NSW match being timed for kick-off at 3.00pm.